I don’t recommend flying in to the Florence airport in general—it’s cheap and convenient to get to Pisa or Rome by train—but it may be the case that your itinerary just works out that way. There is an “official” airport shuttle bus which will take you to the Santa Maria Novella train station for 4.50 Euros (about US $7). But if you are intrepid and very, very cheap, you can take a regular city bus to and from the airport in about the same amount of time for just 1.20 Euros. This is an especially reasonable option if you have to get to the airport from downtown in the middle of the day. I’ll give the instructions from the train station to the airport. To get to the train station, reverse them. You need to take the 29 or 30 bus, which go every 20 or 30 minutes through most of the day. First, buy a bus ticket. There are several newstands that sell bus tickets inside the train station. The buses start on Via Luigi Alamanni, near the NW corner of the train station. If you are in the train station, facing the trains, turn left, walk out of the station, cross the street, turn right, walk down the sidewalk and cross one street. The bus stop (along with many others) is along this block. The train station is ringed with various bus terminals, so you’ll have to be careful to find the right one (29 or 30, they’re at the same stop). Get on the bus and, of course, stamp your ticket. The trip takes 15 or 20 minutes. The bus will take a few turns and then travel primarily down Via Francesco Baracca, a big wide thoroughfare with strip malls and gas stations on it. You want to get off on Via Pratese. You’ll know you’re getting near it when you pass a big fork in the road (Via Pistoiese) and you’ll know you’re there when the bus lurches decidedly leftward after having travelled straight a good long while. Press the button to get the bus to stop. You’ll be on the North side of Via Pratese. Here’s a map that might help. Walk back the way the bus came to Via Del Motrone and turn left. Don’t fret, you’re almost there. The street winds for 100m or so and you’ll reach a big complicated intersection with an overpass. That’s the A11 freeway. If you peer under the overpass, you’ll see the entrance to the airport. Cross this intersection, being careful not to die. You are now at the airport. Congratulations, you have saved yourself 3 Euros! 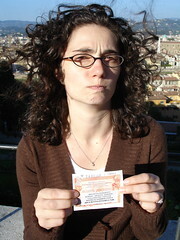 Here’s what it feels like to pay 9 Euros just to get into the Boboli Gardens. But here’s what we looked like most of the time. 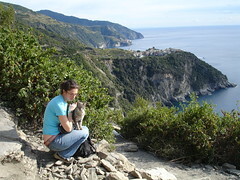 And here’s the kind of thing one could expect “strolling” around Cinque terre. 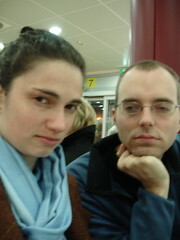 Unfortunately, here’s how we felt by the time we got to the airport. My 30th birthday passed uneventfully. I was last in Italy on my 21st birthday, and I now plan to spend every birthday congruent with 21 modulo 9 somewhere in Italy, drunk on red wine. We need some instruction on how to properly book hotel rooms in Europe. We booked through the Internet and, in each case, paid too much for too little. For instance, we booked an “apartment” in Florence. We thought this meant we would have a small kitchen. It actually meant no front desk and no maid service, period. In two out of three cases, the accommodations were disappointing but not disastrous. However, in the last case, I must tell you that Hotel Garibaldi Relais on Via Pratese in Florence is a scam. It is a dank, unhappy place run by unpleasant people; it has a sewer-y smell; the proprietor has spammed various online booking sites with listings under multiple names (e.g., B&B Caffelatte) and fake positive reviews (e.g., this gem from Crivellaro in Alabama (! ): “It was so lovely ambience and good and friendy staff. During the afternoon it’s literally italian caffellatte in a romantic hall of small hotel.”); they claim it’s “close to everything” when it is actually across the street from the airport; and so on. The Fiddler’s Elbow, which seemed to me on last visit a terrible place, over-stuffed with drunken foreigners, is a very fine place to pass the time over a pint instead of sitting in your stinky hotel room. For those of you who care enough to check the blog, but not enough to call or write (I kid! ), I am happy to report that my mother has been released from rehab. She is able to move about with minimal assistance (though she won’t be happy until she can turn a somersault) and is bickering with my father and grandmother at 100% capacity. I choose to ascribe this happy outcome to the Power of Prayer and not to the skill of her surgeon, the quality of her nursing care, or the astonishing resiliency of the human organism. a) Make the Afghans like us, get them to appreciate our good will, and therefore convince them not to join or lend assistance to the Taliban. In an additional sign of brilliance, the U.S. government* conflates the drug trade with the profits that the Taliban skims off the drug trade. Basically, the Taliban is shaking down rural farmers and drug traffickers by “levying taxes.” Does the Bush Administration think that, if the drug trade were ended or replaced with equally profitable legal transactions, the Taliban would just stop shaking people down? This is like trying to reduce robbery by deciding that nobody is allowed to have money. [UPDATE] If you like a dash of facts with your outrage and colorful metaphors, see Mark Kleiman (via Mr Yglesias). Bottom line, our policy priorities should be: first, defeat the Taliban, distant second, control the drug trade. And: steps taken to control the drug trade should probably have some measurable effect on the drug trade greater than or equal to their (deleterious) effect on priority the first. A note to future cheftestants: I do not advocate ever making a dessert. If it’s good, the best you’ll get is a “meh” (as Hung did last night) and, if it’s bad, your judgment will be called into question (“Why did you choose to make a dessert? Was that the very best dish you could have presented?”). You will not get points for “daring.” Nor does it matter that any paying customer would demand something sweet at the end of a tasting menu: the judges aren’t paying customers and you aren’t a pastry chef. Stick to what you know. My heart is with Hung. Dude’s got mad skills. The worst charge leveled at him so far is that his food lacks “soul” and is not “him.”* I have a feeling, if he stays focused, produces at his usual high level, and surprises them with some tasty, “soulful” food, he can take the prize. I don’t know, somehow I just identify with the cerebral social outcast. He is Marcel’s revenge. I will not be in the least surprised or upset if Casey wins. She’s been consistently excellent, especially in the second half of the season (with the notable exception of the Onion Incident). She’s smart, likeable, and cute as a button. If Bravo has anything to say about it, she’s a shoe-in. I will be surprised but not terribly upset if Dale wins. He has a tendency to lose his head in the heat of competition (e.g., miscounting his servings, forgetting his sauce) and is far more prone to misfires (especially, for some reason, adding too much hot pepper) than either Hung or Casey. He also has a hideous faux-hawk. So there’s that.